"ShushCon offers a lot of entertainment like board gaming, RPGs, tournaments, and Escape room events. They even had “Play to win” for the duration of the convention, offering awesome new games for attendees to take home. The game that’s been keeping everyone on the edge of their seats, Gravity Warfare – Gaming on a Whole New Level™ is NOW LIVE on Kickstarter. 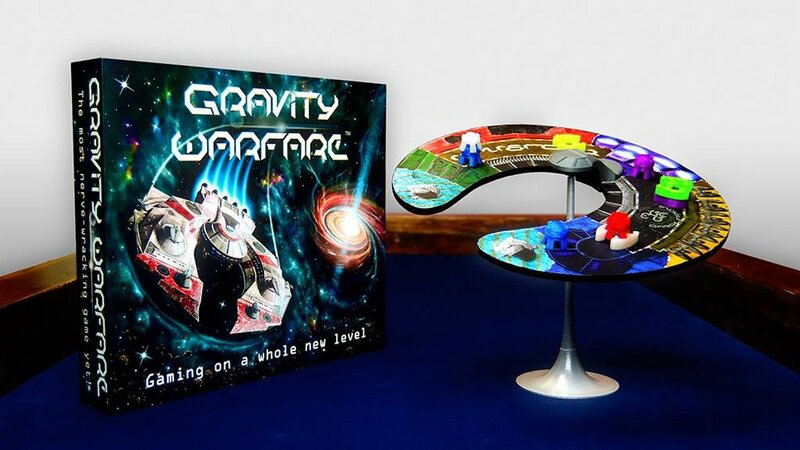 A dexterity and strategy game like no other, you compete with your opponents to play your pieces and be the first to place them on the self-balancing board. What sets this game apart is that you can challenge your opponents with cards from your hand, and make their turns much more difficult to complete to keep them from winning. If they make a mistake, they lose their turn; but if they make the pieces fall, they lose the match! Gravity warfare teaches physics in a very tactile way. The unique balancing board is an excellent lesson in torque as players place pieces and the board reacts. Players see first hand how far from the pivot base they can set their pieces and how it affects the board. This game is also a lesson in friction as pieces remain on the board well beyond what players would expect. Players learn strategy and resource management as they save their cards for the perfect moment for maximum benefit. Gravity Warfare is a family project, created by a father of six, and developed by the whole family. Eight lives and sets of skills bring this game to life; from an artistic background, to mechanical engineering and business management everyone had an important role that fit perfectly to create this game. Help make Gravity Warfare a reality by clicking the link below and support the project today! Every little bit goes a long way. Posted on April 20, 2018 by Stephanie Frey and filed under Tabletop and tagged board game shushCon.